Did you hear? 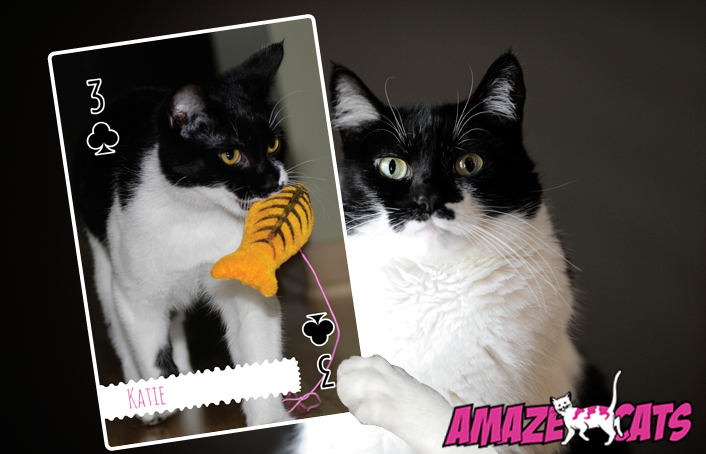 The NEW AmazeCats Next Top Cats Playing Cards are here! 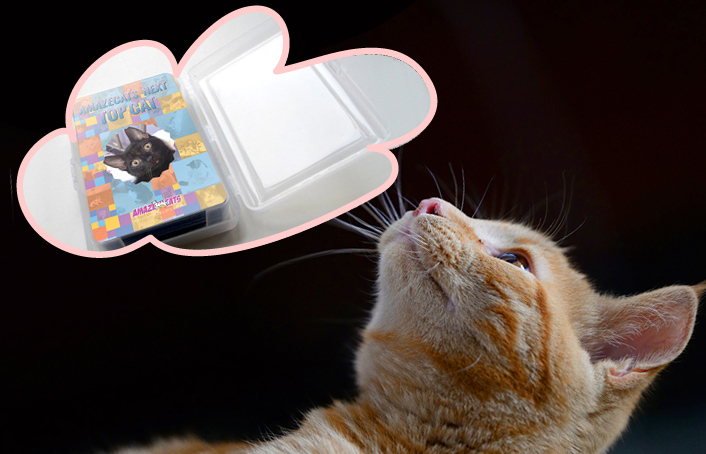 30 famous internet cats, including MANY of our friends that competed in AmazeCats' competition earlier this year, are featured in this newest deck of fabulous feline playing cards! Just between you and me, I'm telling Waffles that I'm the Queen of Hearts. Still, the 3 of Clubs can be a VERY important card. And I think I just made it a WHOLE lot more important! There's 54 cool kitty photos in all. The decks sell for $12 and a portion of the proceeds will be donated to Cocheco Valley Humane Society, a great animal non-profit chosen by the winner of AmazeCats Next Top Cat, Little Bear. You can PRE-ORDER yours now. When you go to the link, you'll see a list of all the cats that will be featured on the cards. Decks will begin shipping on June 26. This is Waffles' ONLY chance at playing with me, so Glogirly better hurry up and place our order. You're on them and Waffles is NOT! Purrfect. We will buy some ;-) Well, hey'd be MORE purrfect if *I* were on them too, but oh well. Hey--why aren't there 52 kitties????? Waffles probably wasn't even born yet! MOL! ...and I think the "top" cats...the one who got like a gazillion votes have multiple pictures in the deck. I'm pretty sure I'm just the 3 of clubs. My boyfriend, Spaghetti Bob is the Jack of Spades though! But Spitty, you will ALWAYS be King. Isn't this all awesome? I'm the three of hearts! Sweet! So many special friends in the deck, we can't wait to get ours... MOM!!!!! That is so amazing, Katie! Concatulations! Pee Ess - Mommy says thanks for putting that song in her head. MOL! Pawsome!!! Have a great weekend! We gotta say it... next deck... Waffles is the JOKER!!!! Seriously, it is a pawesome card Katie, and we saw Spaghetti Bob's yesterday too! pee ess: If you're playing with Waffles, you can tell him if he draws your card, the rules say you get to "club" him 3 times! MOL! Allie: oooooh I LOVE the way those Cherry City cats think! Kate that is a great photo of you on the cards. Maybe next time Waffles. Katie, I'm glad you are taking your rightful place in the pantheon of amazing cats. Aw, the three of clubs just got cuter! Remember that old songs Queen of Hearts by Dave Edmunds?? One of TW's faves. I'm gonna have to change the lyrics and—neena neena—W2 doesn't have a card. We're TOTALLY getting a deck! Maybe you could use two of those clubs on Waffles? Surely the three of clubs is the most important card of all!! Concats and what an honor for Katie!! Purrs from the Zee and Zoey gang! Concats on being the three of clubs Katie.